Italian manufacture Smeg brings the 50s back in style with the Smeg 50s Style range of small domestic appliances. The SMF01BLUK is a stylish stand mixer. There is nothing more rewarding than baking treats with the children. The SMF01 is a beautifully designed stand mixer perfect for preparing cakes, breads or personal favorite - pizza dough. Included accessories are the Whisk perfect for whipping up creams, the beater; always a required accessory come shrove Tuesday and the dough hook assisting with those breads & doughs. Optional accessories include a pasta roller, spaghetti cutter and meat grinder. Featuring a 800w direct drive motor, this SMF01 stand mixer shares the common features with your latest washing machine or refrigerator. All this directed power is sent straight into the large 4.8 litre stainless steel bowl. Surrounding the motor is a die-cast aluminium body with anti-slip feet making this the perfect style and performance accessory in your kitchen. 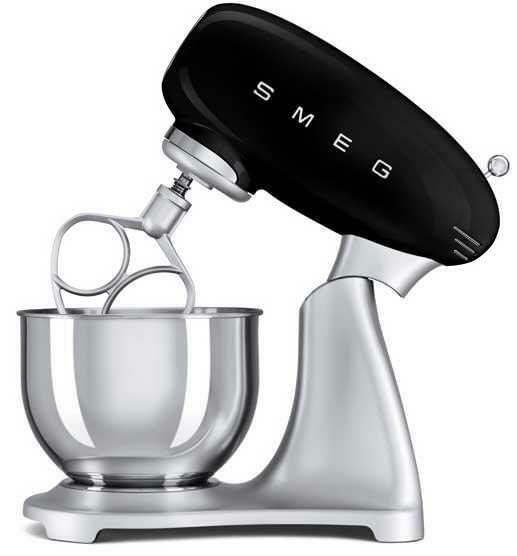 10 power modes provide full control of the mixing of the contents of the bowl - need something to bind together slowly, the SMF01 has you covered, a quick whisk, again this high powered stand mixer from Smeg has you covered. The tilt head mechanism ensures ease of access to the bowl with little mess. The whisk motion is controlled by a planet action style ensuring even results throughout the 4.8 litre capacity device. Design choice has not traded off in performance and quality - the Smeg 50 range with the TSF02 Toaster features the latest technology with the heart and soul of Italian design. Looks amazing in our new kitchen.Kids love when helping them to bake.